One of the benefits of purchasing at the Creative Store is the 5% cash rebate members will get on all products (among many others). However this is set to change as Creative announced today that with effect from 5 December 2008, Creative Club will cease to exist. 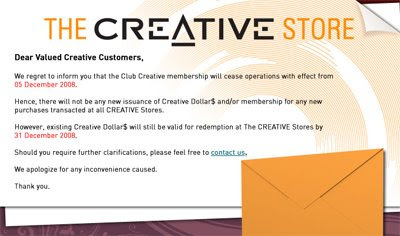 Although one user Natalie did sent us an email 2 weeks ago telling us about this, Creative Customer Support played it down with us saying that the "Creative Club membership card is still active for our loyal customers." Existing Creative Dollar$ will still be valid for redemption at the Creative Stores by 31 December 2008. If you have any questions about your Creative Membership, feel free to contact Creative here.